The free ride could soon be over for larger businesses that rely on Foursquare’s database of bars, restaurants, boutiques, and the like. Pursuing new revenue streams, Foursquare Labs plans to begin charging some enterprise users to access its database of local venues. “Foursquare has begun conversations with a handful of large enterprises using our database for commercial purposes to contribute to the upkeep and innovation of our platform,” the company stated. The decision is not likely to affect smaller businesses, Foursquare noted. The initiative follows a major reorganization at Foursquare, which popularized mobile check-ins and game-like features, such as the ability to earn “badges” for frequently engaging with the app. The company recently divided into two distinct apps: A new app named Swarm that does what everyone associates with the Foursquare brand, which allows users to check into physical locations and become the “mayor” of their local bar. 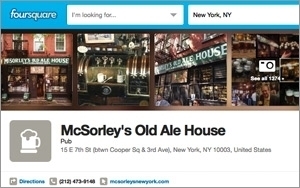 A second is the more Yelp-like service, which took the Foursquare name. Proving its obituaries premature, Foursquare recently reported a revenue increase of about 600% in 2013. During the first quarter of 2014, year-over-year revenue growth was on track to exceed 500%, CEO Dennis Crowley said during a recent on-air interview with CNBC. Web watchers have attributed Foursquare’s growth to a shift from reward-based friend-tracking to Yelp-like local business listings and reviews. Making Foursquare’s efforts to branch out all the more pressing, Facebook recently debuted an optional check-in featured named Nearby Friends. Given Facebook’s sheer size, the service represents an immediate threat to Foursquare, along with Google's Latitude service, and Apple's Find My Friends. The Wall Street Journal first reported the news on Thursday.